January 20, 2014 — One of the largest passively-cooled instrumentation shelters ever constructed is being supplied by Intertec to house remote control and instrumentation equipment required for a new natural gas collection project in the Middle East. Without any electricity, the cooling system reduces interior shelter temperatures by some 20 degrees Celsius – to enable the instrumentation to operate at its desert location. Intertec is supplying three shelters for the project. Two employ active cooling and were delivered at the end of 2013. The third shelter, which will house solar-powered instrumentation and uses innovative passive cooling technology, is currently nearing completion. The shelters are designed to protect supervisory control and data acquisition (SCADA) systems – comprising remote terminal units (RTUs), telemetry network equipment and associated electronics ­– for the control infrastructure of a new gas pipeline that is being constructed on the coast of the Persian Gulf. At present, much of the gas from oilfields in this part of the world is burnt off as waste at the point of extraction. This project is designed to improve resource management by collecting and using the gas to power seawater desalination plants that are currently fuelled by oil. Environmental conditions at the site are severe. The coastal location means that the atmosphere contains corrosive salt and chlorine, as well as sulphur from the natural gas. During the summer months, additional factors include extremely high levels of UV radiation and daytime temperatures that can reach 55 degrees Celsius in the shade. Protecting field instrumentation for long life-cycle applications under such extreme conditions requires specialist knowledge and materials. Intertec has constructed all three shelters using the techniques and composite materials that it uses for its high performance ARCTIC range. In this instance, 85 mm thick walls are employed – with 4 mm inner and outer skins of GRP sheeting (glass reinforced polyester) sandwiching a 77 mm layer of insulating foam. The GRP material layers are inherently inert and virtually immune to the corrosive effects of salt and aggressive chemicals. Intertec is also able to manufacture the GRP in large panels without introducing any metal components that could create thermal short-cuts and degrade insulation efficiency. All external surfaces are protected by a thick layer of UV-resistant gel-coat. Two of the instrumentation shelters that Intertec has built for this project are near to the electricity grid and are able to use active cooling. Each of these shelters is equipped with a custom 3 kW air conditioning system. A special corrosion-resistant external heat exchanger was developed for the application. Another major design challenge involved creating a cooling system based on a CFC-free refrigerant such as R-134A that could work efficiently in very high temperatures. The third shelter that Intertec is supplying for the Middle East gas project will protect instrumentation sited in a remote location, where connection to an electricity grid is not possible. Here, all instrumentation power is derived from inverters, fed by batteries that are recharged by a photovoltaic generator. This system’s strict power budget means that even though the shelter has a very large volume of 142 cubic metres, its cooling system has to be entirely passive. Intertec's passively-cooled shelter comprises two adjacent walk-in rooms with their own entry doors. One room contains the rechargeable batteries, while the second room houses all the system instrumentation and electronics including a PLC, computer network, power inverters and a controller for the external photovoltaic generator. The overall dimensions of the contained area are 5.2 metres x 9.1 metres, with a floor-to-ceiling height of 3 metres; the entire roof area is covered by a heat exchanger and sunshade combination. The passive cooling technology Intertec employs for this project is based on thermo-siphoning using water – which is cooled and heated by the natural swing of day and night temperatures. The rear of the equipment room houses an 8,000 litre thermally stratified water tank connected to two closed-loop thermo-siphon systems formed by internal wall-mounted and external roof-mounted heat exchangers. The water circulates entirely due to natural convection. No pumps are involved and the process operates entirely automatically to provide highly reliable, safe and energy-efficient cooling. 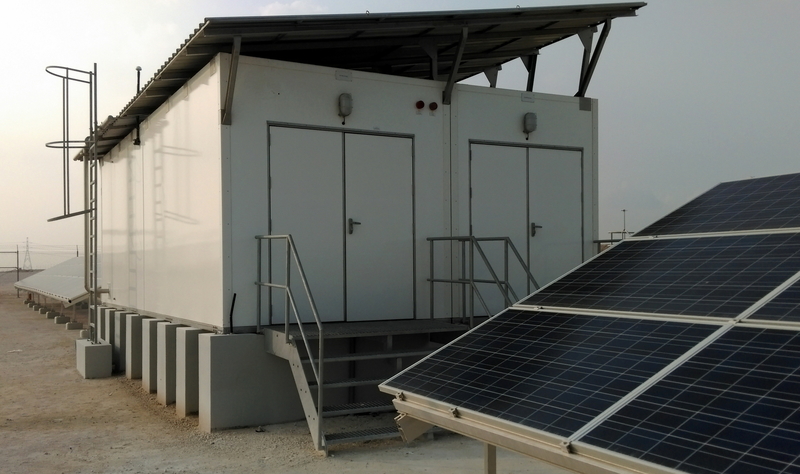 The passive cooling system is designed to accommodate the maximum power dissipation of all equipment in the shelter – amounting to 1,080 watts – under worst-case conditions, which is when the hottest day of the year follows the hottest night. In this part of the Middle East, daytime temperatures during summer months can reach 55 Celsius, while the night time temperature might only sink to 30 degrees. Even under these extremely demanding conditions, the cooling system ensures that the shelter’s internal air temperature never exceeds 35 degrees Celsius. Intertec has extensive experience of passive cooling, having offered the technology as an option on its environmental protection shelters for more than a decade. The company also produces a wide variety of other forms of cooling systems for shelters and enclosures, ranging from forced circulation passive systems and hybrid units combining active and passive technology, through to complete air conditioning systems. The panels required for these shelters were produced using advanced CNC machines specially designed for Intertec which can perform cutting, routing and drilling over extremely large working areas. 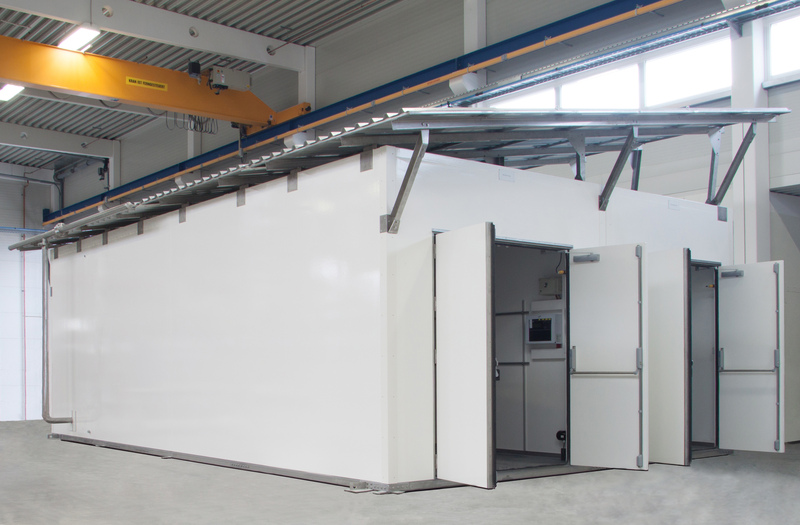 This automated approach allows Intertec to produce large, highly insulated panels for specific applications very easily and quickly – such as those for the passively-cooled shelter required for this project, which has a footprint of almost 50 square metres. This large passively-cooled shelter is being constructed by Intertec to house remote instrumentation for a new natural gas project in the Middle East. 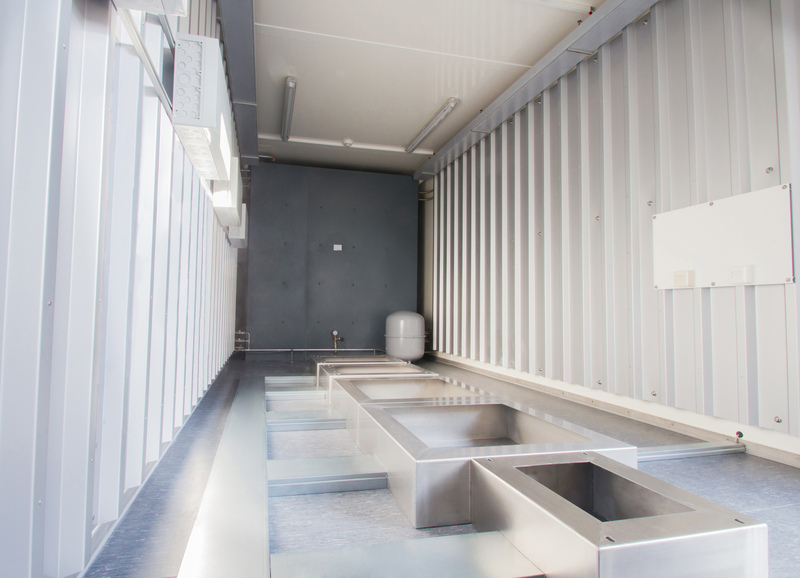 The equipment room of Intertec’s passively-cooled shelter features two large wall-mounted heat exchangers, a thermally stratified water tank and an expansion vessel. One of Intertec’s passively-cooled shelters installed on site.